Building a project is often the most exciting part of it. This is where you go through your main stages of failures and success. I, having built a project that failed, had already went through this phase. But now, using my new structure, I had a lot more fun. First off, my sister was helping me so that provided company. And also, I had learned from my mistakes. Now when I was at a stand still, I always referred back to my old machine and asked myself three questions. How will this step be triggered to start? How will this trigger something in the end? And, most importantly, how might this step fail? If I had properly answered the first 2 questions, which often came very easily, I then listed the possibilities of how this step may not work. I sat and thought about each possibility carefully, because if some of the possibilities seemed likely to happen, then this might not be the most stable step. Of course, there were always some possibilities of why a step wouldn’t work. That’s what made building it fun. If I had decided to not incorporate a step into my project, I wouldn’t just dismiss it that quickly. I would then try to modify the step so it could work. This insured that all of my ideas were not wasted. But when building, I tried to always use a variety of steps. For my project to succeed, I needed 8 or more steps, none of them repeating. But I had also set a goal for myself. While building, I wanted to use at least 4-5 simple machines and clearly show them in my project. Building this Rube Goldberg machine was far from easy. But I worked in stages, or different levels, to help sort my ideas. Each stage was connected, somehow, many times with a block or a ball. I planned to use 5 stages, the last one finishing my project. While building, I noticed a lot of things in my project. 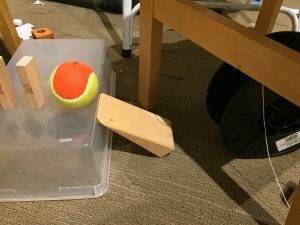 I noticed that the size and weight of a ball mattered immensely while building. Also, I learned to be precise. I marked some of the blocks I used to insure that things would be exact and perfect. One of the my hardest times came when I had just started to build. I just did not know where too start! I tried building different parts of my machine, but when one step failed, I got panicky, and a bit worried. I didn’t have a steady beginning, middle and end. That wasn’t good. One day, I sat down next too my project. I stopped with the nonsense which I had started for the last few days. I took a deep breath. And properly tried out the first step. None of the steps worked at first, so I did get a little nervous at times. But for the most part, after that, as long as I had something planned to do that day I did it. My biggest worry in this whole project was my baby brother. I was building downstairs, in the basement, somewhere he had free access too. And while I was at school, I could not keep him out. Also, I had taken his favorite toy for the first step of my project. And I bunch of his books to prop things up. Once my brother came down and stole two of the best balls I had. One of them started my machine. He lost that ball, but gave me the other back. I searched for a good time, but could not find the ball. And no ball worked as its replacement. I tried a lot of things. Finally, I found the ball. Right under my own pillow, like a gift from the tooth fairy! That’s where it was the whole time. This taught me to be a lot more careful about my things and to keep careful watch of my little brother. I felt the most proud of myself when I had finished a step in which a wheel would be knocked into by a ball. The wheel would then yank off a domino from a higher surface an let a marble roll free. This was a very complicated step. I had to mark a bunch of things and try out a ton of examples. Once I finished, I was extremely proud. Later, my baby brother took the wheel, broke it, and then gave it back. After that, I had to restart the whole step, which I ran into more problems with later. One of my biggest stand stills was when I completed the second stage. But, ironically, this also lead to my best moments while building the whole machine. The second stage used a seesaw to bring a ball to the ground. But once the ball was on the ground, I was stuck. The ball could not go up, nor could it travel on a flat surface for a long distance. I was stuck for a week. 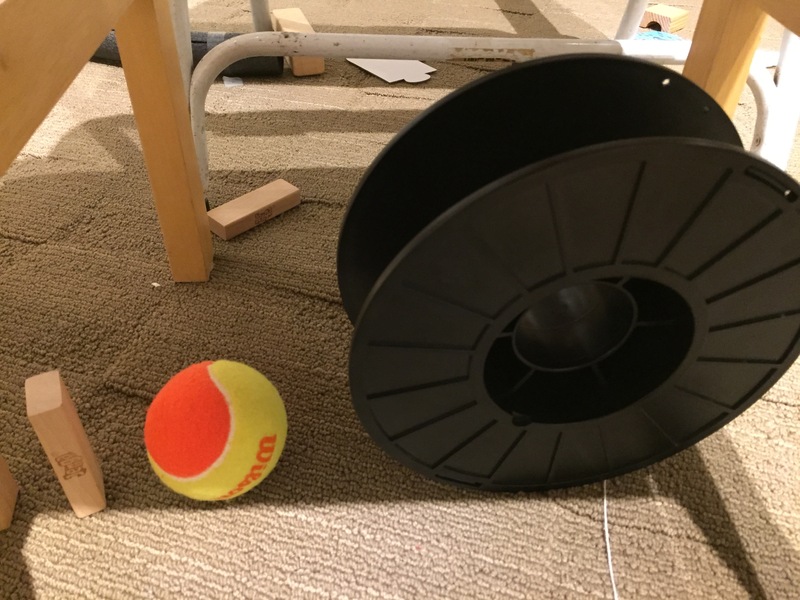 Finally, I devised a plan involving a spool. But where could I find one. I searched the whole house. Nothing. I looked at school. Nothing. Finally, after about 3 days of search, I borrowed a spool from my friend. After that, I was able to complete 2 more stages. And it was all a breeze. Ideas just kept on coming. All because of one failure, that led to my greatest success. This down below is my first blueprint. It consists of 14 steps and has a key located at the side. Many times I hear the phrase “Without a good plan, you won’t have a good machine.” A plan is often described as the foundation of a contraption, and without a sturdy base, a building could never hold up. 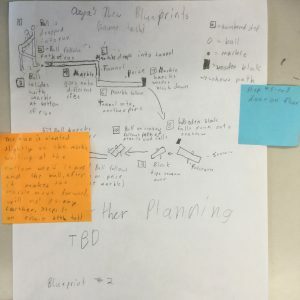 From the moment my teacher announced that we would start our Rube Goldberg projects, I had already started creating a plan. A Rube Goldberg machine is a device created with different cause effect motions that has a goal to achieve a simple task. My plan started with small, but important things such as whether or not I wanted to work in a group. I decided to work solo when that came to mind. 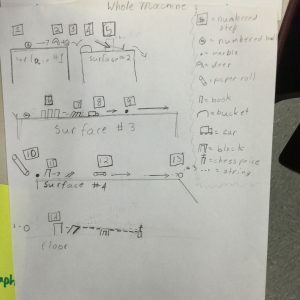 By the time my teacher finished talking, I had already devised some basic plans. 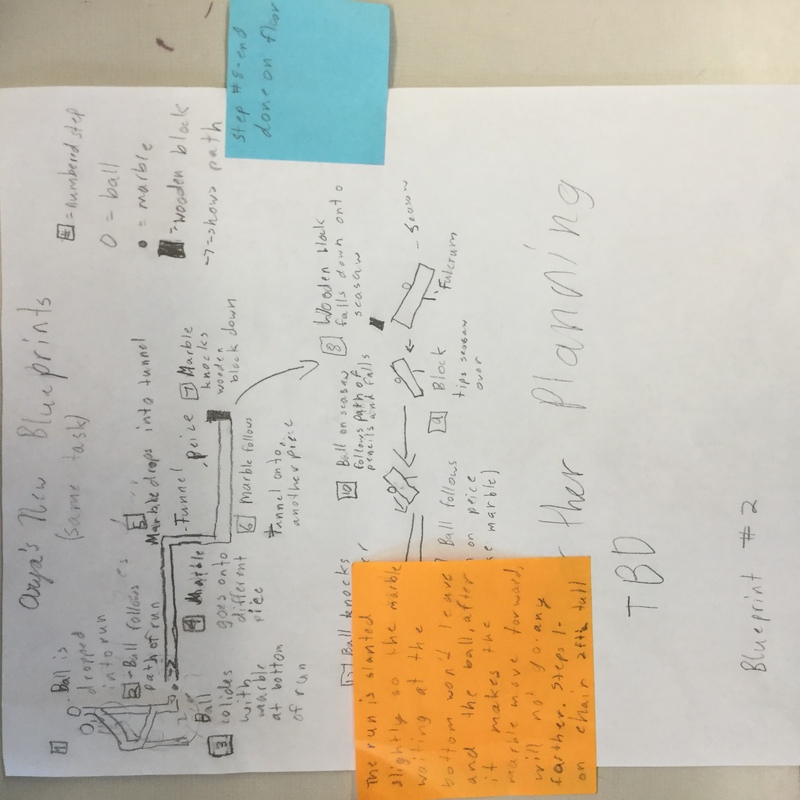 One of our requirements in our Rube Goldberg assignment was to turn in an accurate plan that showed the complexity of the gadget you were planning to build. When I started working on the one I would turn into my teacher, I started by working backwards. Since my machine would achieve the task of moving a chess piece on a board, I began by thinking about how my device would achieve that task. Once I had that idea, I watched a couple of the videos that my teacher suggested. I jotted about a couple of the parts in the video which stood out to me, and then switched them up a little so I wouldn’t be copying. This video helped me gather ideas for steps that I could incorporate into my machine. It also gave me a good idea of what a finished Rube Goldberg project looked like. 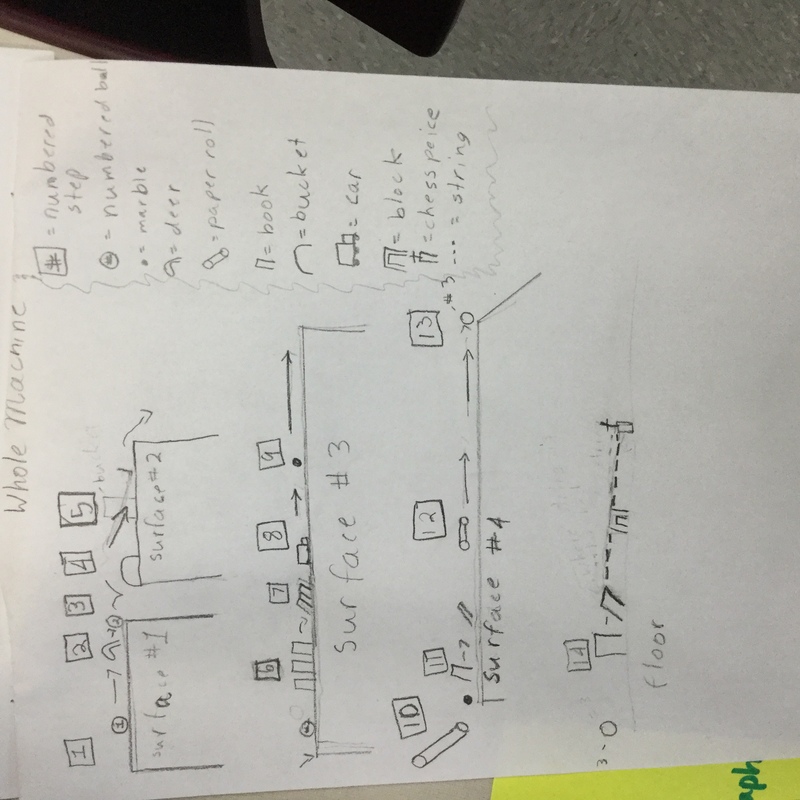 When my teacher announced that our next assignment would be to design a Rube Goldberg machine, I was exhilarated. A Rube Goldberg project is an apparatus made up of complicated, chain reaction steps that had an objective to complete a simple task, such as sharpening a pencil. This was one of the few projects where we could choose our own partners. I thought that many people wanted to work in pairs, but I enjoy working by myself for a couple of reasons. First, I could work on my own time. Second, I could use my own ideas. And third, sometimes people don’t do an equal amount of work when in a group or they easily get distracted. So I decided that working solo might be a little more useful during this project. For me, the hardest step of any project is thinking of the idea. It’s always the first step and you can’t do anything unless you have a strong beginning. What I started with was brainstorming. I thought for about an hour about different blueprints and searched up ideas that others had too for inspiration. Finally I got about twenty. After that, I started eliminating projects that were too complicated, too basic, or too accessible. Soon the twenty ideas became three, all of which I had thought of on my own. And, two projects I ruled out almost immediately. That left me with an idea. I wanted to move a chess piece for my Rube Goldberg project. This would be appealing, unique assignment and a challenge that I was ready to take on. This site helped me understand what a Rube Goldberg contraption was.